Getting to the slopes 500 ft.
What a place! SkyRun is proud to announce our newest listing a fantastic 2 bedroom 2.5 bath townhouse across the street from the largest ski area in the USA, Park City Mountain Resort. Fully remodeled, you feel like you just walked into your own winter wonderland. In the summer, the unit is right on the golf course, making for great access for golfers, and also a peaceful setting for evening walks. There is only a quick, easy 3 minute walk to the lifts, and the cross country ski trail goes right by the unit. Upon entering you will be greeted by rustic tile floors, and enter the light and spacious great room with an easy and cozy gas fireplace The living room has deluxe leather furniture, with a twin sleeper sofa, carved wood floors, and great open space views. Youâll have all of the style and creature comforts to make your stay unforgettable: very fast wifi, complimentary Netflix and Hulu. The fully equipped kitchen is loaded with stainless appliances, granite countertops, and hickory cabinets. There is also a powder room for convenience, and a washer/dryer. Grab your morning coffee or aprÃ¨s-ski beverage and fall in love with the 180-degree view of the mountain base and golf course. Get a first-hand look at the conditions on the mountain and the golf course without leaving the couch. When you are ready to hit the slopes you can put your boots on and walk 320 steps to the Three Kings chair lift â no need to get in the car! You may even catch a glimpse of a moose or deer sauntering by. The bedrooms are separated, one on each floor for privacy and each with an en-suite bathroom. The main level master bedroom is outfitted with a TempurPedic king bed, lots of storage, great views, and an en-suite bathroom. The bathroom has a huge shower and its supplied with boutique soaps, and shampoos. Bedroom #2 is upstairs and has a queen bed and 2 twin beds. 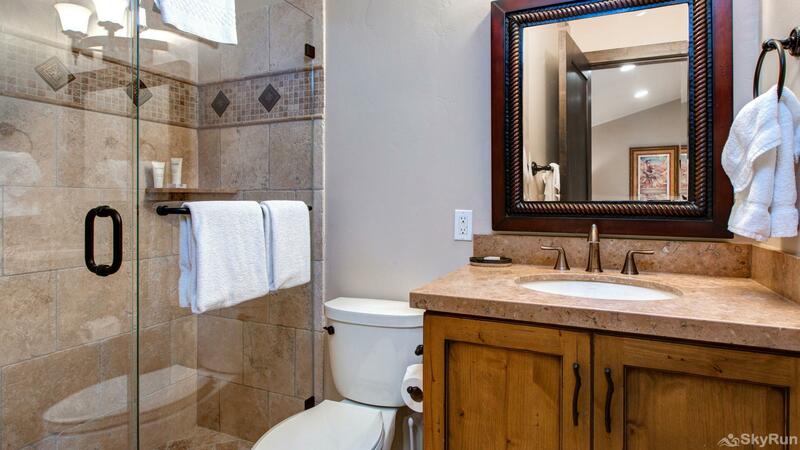 The large en-suite bathroom has dual sinks, a bathtub, storage and amenities. SkyRun Vacation Rentals has been providing vacation lodging for 15 years and with 13 locations around the providing a superior experience of our guests. Getting to the slopes: 500 ft.